Developing a content strategy is more than just organizing your content into categories. Your content strategy for online help should help users find the information they need. And that’s why keywords are important, even in your content strategy. Today, users are searching online help, documentation, customer support, before buying products. This is where building a content strategy that supports online search can help drive traffic to your support site, and ultimately to your product site. At edc, we thought long and hard about how to build content strategy that meets customer needs – yours and your customers. That’s why we developed a content strategy management tool inside edc. To help you get started, we’ve come up with a short list of 5 steps to creating a content strategy that drives traffic. Ok, we’ve been repetitive here at edc. By now you know how we feel about the importance of building customer personas. Your customer personas are important to when you create content that meets the real needs of your users. But contrary to traditional documentation content strategy experts, we ask you to take your personas a step further. Sure, think about your current customers; but also think about your future customers. In the spirit of breaking down silos between marketing, sales and documentation departments, work together with teams inside your company to identify your current and future customers. Once you have defined personas and understand who your customers really are, you can start to research and build a list of keywords that they commonly search when looking for information related to your product. We’re not talking about writing marketing content in place of doc help; but we are talking about finding out what your customers and potential clients are searching for. They have needs; find out what they are. Now, use your personas and keyword list to start building a content strategy in edc. Using edc content strategy management, you can create a content strategy that makes sense to your customers and uses keywords they search often. Each content strategy acts like a folder for content. You can even disable content strategies when they’re no longer relevant, without deleting them completely. 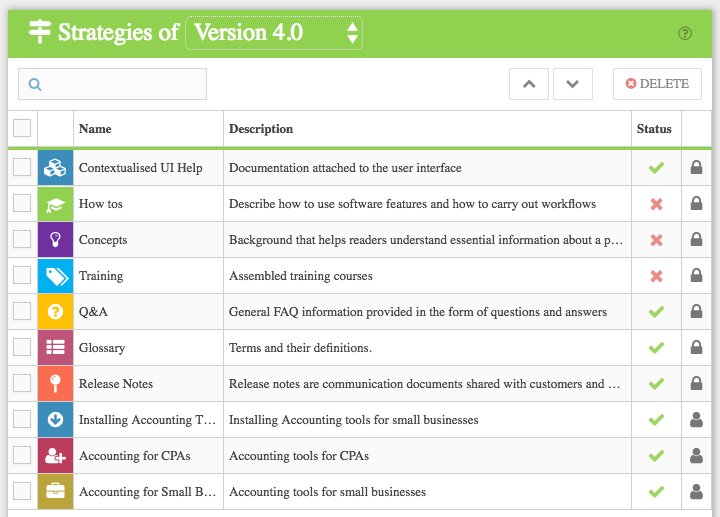 In this example, we disabled the default content strategy and added new ones based on common keyword searches for accounting software tools. 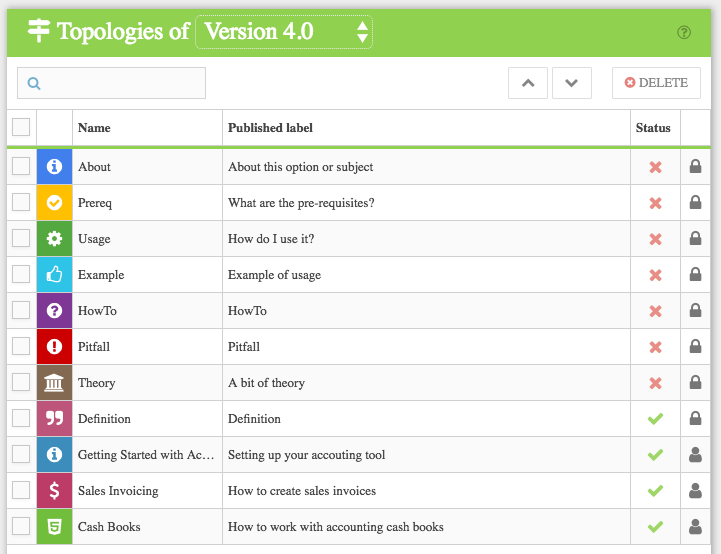 Note, the descriptions of each content strategy use long-tail keywords commonly searched for accounting tools. Topologies help identify and organize content within your content strategy. Think of them like sub-topics. Use edc content strategy management to define your customized topologies based on keywords. In this example, we’ve broken down the content strategy topics into sub-topics. Once again, we’ve used keywords searches to customize the names of our topologies and their descriptions. Don’t stop with content strategy and topologies. Use keywords in your content as you write in edc. Search engines love to see keywords repeated in your titles, headings, and content. You can even add keywords to your image alt tags and name your images according to your selected keywords. And in case you think we forgot about external linking, think again. We know how much search engines love external linking! In edc you can add external links to your embedded software help and in your online help. Let’s say you have instructional videos on YouTube. With edc, you can link directly from inside your software or from your support site. Have a related blog article? Use edc to create an external link. Do you have a webinar signup page for ongoing training? Create a link. With edc, you can create information that is exactly what your users need and attract new customers with the same content. Our content strategy management tool allows you to give users what they need, when they need it and where they need it. When you use content strategy with keywords related to your product, you can create an information product that reaches new customers and servers your customers better. Want to try edc for free? Previous Is the Era of Big Doc Over?